GreazeFest - Latest News: 2016 ARCHIVE: Redlands Rockabilly Revival is a smash hit! 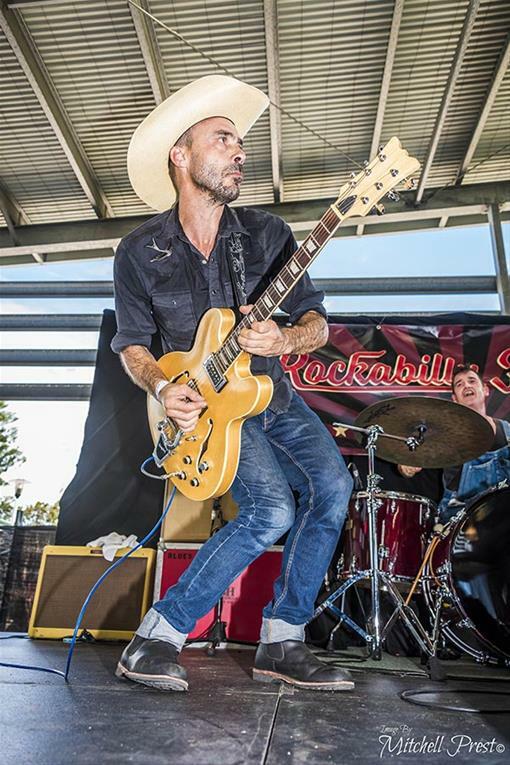 2016 ARCHIVE: Redlands Rockabilly Revival is a smash hit! And that’s a wrap! We hereby declare the first ever Redlands Rockabilly Revival a smash hit! Despite some early rain, the sun came out and over 4500 people rolled up to enjoy what was a sensational day with a ‘wish-we-could-bottle-it’ vibe. The huge concert space became the place to hang out, where people could dance and enjoy the sounds from a tip of the top selection of bands including The ERT Trio, Lovejoy Surf, DJ Leapin' Lawrie, Twang, Rusty Pinto with Shotdown from Sugartown, plus the sensational Bellfuries from the USA. The Pinup Parade drew a huge crowd to the stage to see our 15 pinup finalists strut their stuff on stage. Big thanks to parade Mistresses of Ceremonies, Miss Chrissy of the Lindy Charm School and Madeleine Mayhem for overseeing a stunning parade. Of our fifteen finalists, two pinups, Miss Harlem Tale and Miss Rockabilly Tam, were chosen to receive our fun prize packs, which were filled with goodies from Lindy Charm School, Western Wac, Lori Lee and GreazeFest. The hot rod displays had to be split into two sections to meet a ‘no car movement on the main oval’ public safety requirement at the Showgrounds, which meant that the 150 cars and drivers who braved the weather to show and shine were parked in two separate display areas. Once the sun came out, the cars were bright and glistening and both displays were well attended by the viewing public. On the main oval were many market sellers who presented their cool collections of rockabilly gear and all sorts of temptations and goodies to take home. The Kustom Art Display put together by Danielle Mann of Black Lagoon Designs showed off an inspiring collection of works by many talented custom artists. The Rockabilly Revival also included complimentary entry into the Redlands Museum and hundreds of visitors walked through their doors to take in and experience their huge showcase of historic displays.